Chocolate and Peanut Butter are a match made in heaven. The combination of the two can turn any frown upside down. The combination of the two can leave you licking your licks for hours after the item has been finished. The combination of the two are just perfect to me. 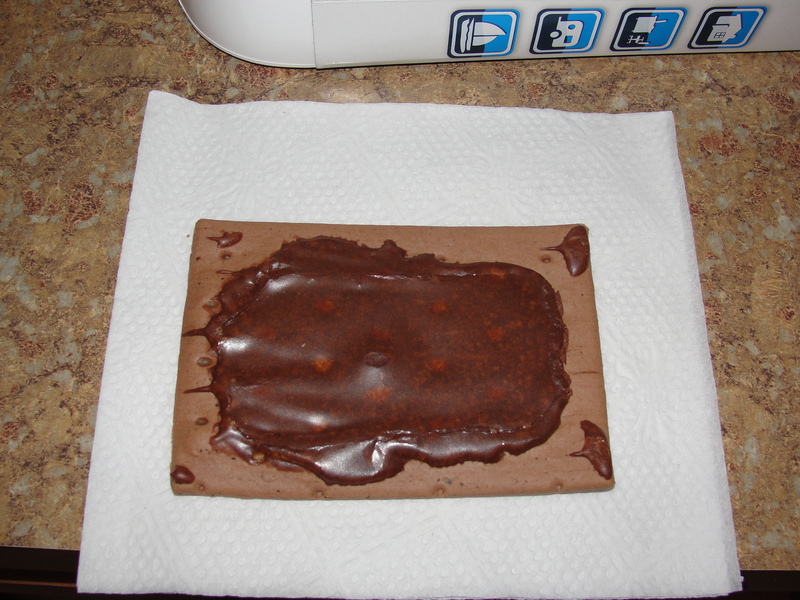 A few months back, Pop-Tarts released a Chocolate Peanut Butter option. Now, I can’t even tell you the last time I had eaten Pop-Tarts prior to this. It’s been at least a good 10 years…at least. On rare occasion, I used to kinda like the Brown Cinnamon Sugar Pop-Tarts but, they were never something that I ate frequently. Since the release of these, I have bought two boxes worth. Chocolate Peanut Butter Pop-Tarts, you are my Golden Ticket. 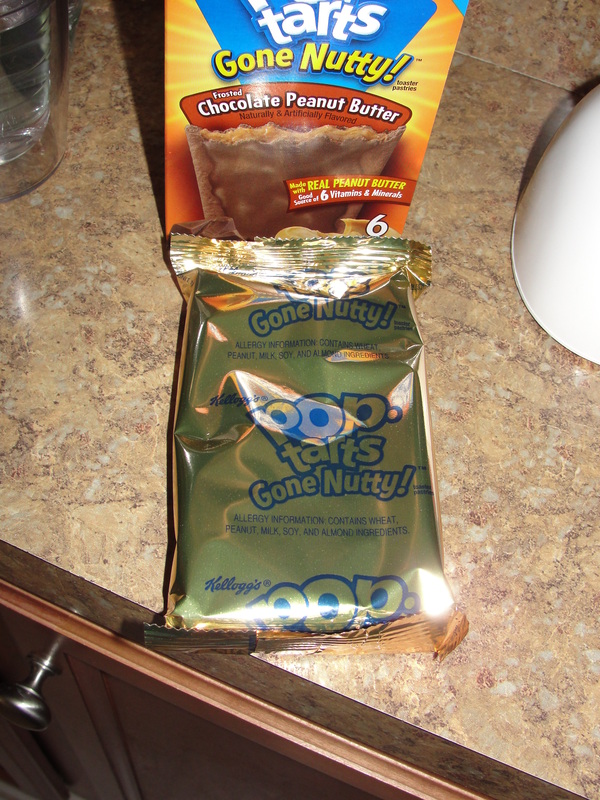 The Pop-Tarts come in a typical box however, you only receive 3 packs of 2 rather than the usual 4. I have only ever eaten one of these at a time – at 200 calories a piece, these are not a light snack. As you see, the Pop-Tart is delivered in a Golden Wrapper. How special. I feel all Willy Wonkaesq when I open these up. Upon opening the Pop-Tart, and placing one in a Ziploc bag, I find the outer appearance to be somewhat sad. The chocolate frosting kind of just ends in different places throughout and the crust appears very discolored. I have never liked the fact that the crust takes up so much of the Pop-Tart. I will say it didn’t seem to take up as much room as I remember but, then again, its been a while. I toasted my Pop-Tart on setting 2 in my toaster. This produced a pastry that was quite warm but not quite hot. I begin to eat the crust pieces first. 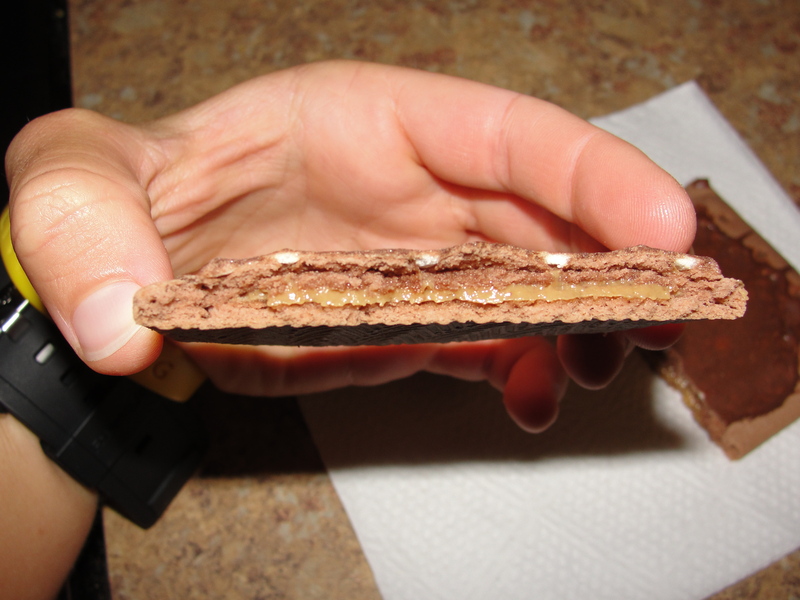 The crust is very soft to eat and reminds me of the Double Chocolate Fudge Stripes cookies. There is certainly a flavor of cocoa and the actual crust is pretty good. Then, I break into the Pop-Tart and find Paradise. The inside Peanut Butter is gooey and soft. Taking my first bite, I find the combination of the peanut butter, mixed with the slightly-crunchy chocolate frosting, and soft pastry layer, to be divine. The flavors all mix together so perfectly and I savor every single bite that I take. Plus, the flavors get better as I continue to eat. With every bite, I am transported into the mystical paradise, known only to true Chocolate Peanut Butter lovers. I really hope these suckers stick around because I promise you they will be on my must-buy list. Even eating one of these at a time, I am filled with the delicious goodness of chocolate peanut butter. While the peanut butter may not be the best quality, it is still quite good and it not overly sugary. As for the chocolate, the taste of cocoa and a crunchy bit of frosting, leave me wanting more and more. I have no plans on trying any other Pop-Tarts (besides, maybe, the Peanut Butter) but these have sure made me love the item I avoided for so long. If you like Chocolate Peanut Butter, try these. Right away. Get up, go to the store, purchase, toast & enjoy. I promise you these will be your Golden Ticket to Paradise.